Vacation is a time for family fun. 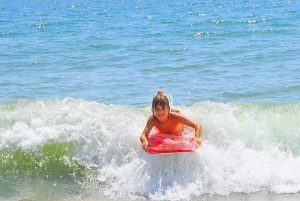 Plan your family vacations in Ocean City, Maryland! Discover Castle in the Sand Hotel, a family-owned Ocean City, Maryland oceanfront hotel with a variety of Ocean City accommodations to suit your vacation needs. Days begin with beautiful sunrises and peaceful strolls along the clean, unspoiled beach. Continue the day with a dip in the Atlantic Ocean, sunbathing on the beach, or relaxing on our patio. Enjoy our Olympic size swimming pool with diving board where you can swim laps, lazily soak up the sun or relax with a poolside cocktail. Nighttime brings pleasant evenings at the beach and entertainment for all ages, either at The Castle or nearby. An eventful day gives way to pleasant dreams in your comfortable well-appointed Ocean City Hotel Rooms at The Castle. A visit to The Castle in the Sand Hotel creates lasting memories for you and your family to cherish for years to come. 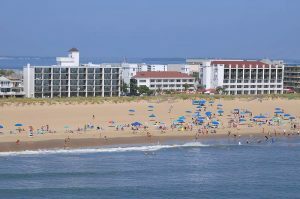 The Castle in the Sand Hotel is an ideally located Ocean City oceanfront hotel on 37th Street in Ocean City, Maryland, and is the closest oceanfront hotel to the Ocean City Convention Center. Ocean City restaurants, Ocean City entertainment and recreation, the Ocean City Boardwalk, the Ocean City Convention Center, and shopping are all only minutes away. So, whatever your desires and needs, The Castle in the Sand meets them all. Castle Guests can enjoy our 25 meter Olympic swimming pool with diving board – the largest pool in Ocean City! We also are one of the only hotels in Ocean City, MD who provide food and beverage service on the beach in season. There are free children’s activities in the summer, beach equipment rentals, a sand volleyball court, and an ice cream shop all on site. 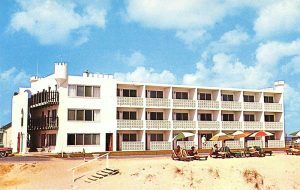 The Castle in the Sand Hotel is a family-owned, family-operated hotel started by The Showell Family in 1958. At The Castle, it is and always has been our desire to provide clean, comfortable, affordable accommodations in Ocean City, Maryland. We hope you and your family will make memories and start family traditions with a vacation at The Castle in the Sand Hotel. The Castle has a long-standing reputation as one of the finest hotels in Ocean City, Maryland. 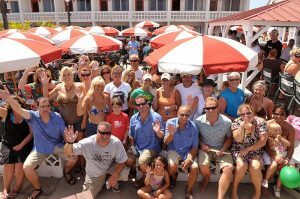 Year after year, many guests return to The Castle for their vacation in Ocean City, Maryland. We recommend you make your reservations early as our accommodations sell out quickly. The Castle is an oceanfront hotel and beachfront resort in Ocean City, Maryland. We are located on the Atlantic Ocean between 37th and 38th Streets, providing our guests with a convenient location to all of the popular Ocean City area attractions such as the Ocean City boardwalk, rides, amusements, water parks, watersports, and Ocean City golf courses. We are only steps away from Ocean City restaurants, and the Convention Center in Ocean City. We are an easy drive from many nearby cities. Ocean City’s weather is warm and inviting, offering ideal temperatures for your Ocean City vacation in the Spring, Summer and Fall seasons. Spring temperatures average 63 degrees, while Summer warms up to a pleasant, balmy 84 degrees, and Fall, our “second season” at the beach, brings an average temperature of 62 degrees. Ocean City has approximately 200 sunny days every year. The Castle is the vacation home away from home for many guests who return year after year. Families come to The Castle every year to make new memories that will be cherished for a lifetime. 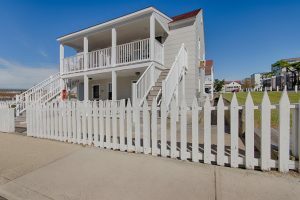 The Castle is the perfect place for an ocean city family vacation resort, an Ocean City family reunion, a beach wedding in Ocean City, Maryland, an Ocean City golf vacation, a romantic weekend getaway, or a relaxing Ocean City tour for senior citizens. We know that choosing an Ocean City hotel and Ocean City accommodations can be overwhelming. At The Castle, we would like to make your vacation planning as easy as possible by providing guests with information about our resort. 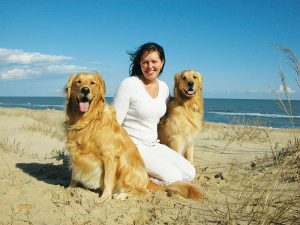 Not all Ocean City rooms accommodate the family pet! If you are searching for a pet-friendly hotel at the beach, The Barefoot Mailman Motel is the perfect choice. Located at 35th Street on the ocean side of Coastal Highway, miles of beach and the Atlantic Ocean are only a few steps away. 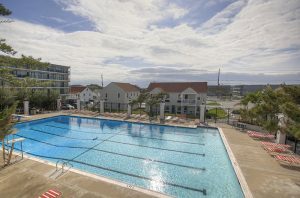 The Barefoot Mailman’s midtown location is conveniently close to the popular Ocean City vacation destinations… Ocean City Convention Center, the Ocean City Boardwalk, rides, amusements, Ocean City golf courses, water sports, Ocean City restaurants, and Ocean City fishing. 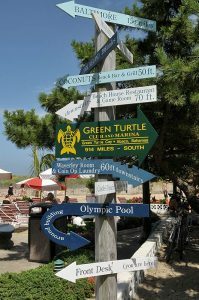 To make a reservation for The Barefoot Mailman Motel, visit our website at www.barefootmailman.com. Book early! Accommodations for pets fill up quickly! Our newest resort, The Green Turtle Club, is located on pristine Green Turtle Cay and is home to crystal clear turquoise waters, beautiful white sand beaches, and tranquil ocean breezes. The island of Green Turtle Cay is unspoiled, unhurried, undiscovered. The resort offers the perfect combination of serene environment and lavish settings. 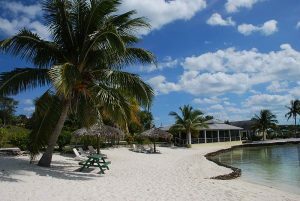 To experience the tradition of old English-Bahamian hospitality, visit our website at www.greenturtleclub.com.